The fish tacos from Benitos, or almost anywhere in Los Angeles, it seems, come with an incredible amount of shredded vegetables on top. 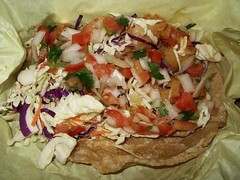 I'm not crazy about that, but who am I to poo-poo the highly varied presentation of the fish taco? Oh wait, I have poo-poo'd the fish taco before. Looking back, the aesthetics of the fish tacos at El Pelon soar past those of the fish tacos I've seen on the west coast. In fact, I get a lot of hate mail for the bad rating of the El Pelon fish taco. Now that I have a better measure of comparison, I think I should return to El Pelon for a second try. This Benitos Taco Shop meal was rated: 3.1. Wednesday, March 15, 2006 by Jonah.